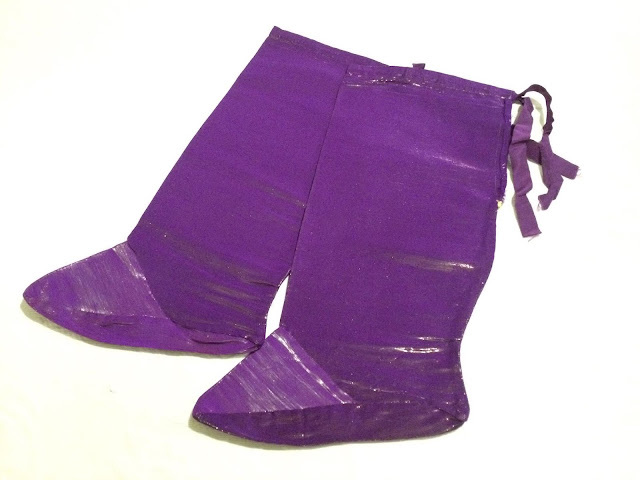 Since we have already covered off pontifical sandals and gloves, I thought it would be fitting to mention a closely related and equally lesser known bit of vesture: buskins -- or caligae in Latin. Buskins are essentially a liturgical form of "stocking" that is worn over the foot and up to the base of the knee where it is tied on with ribbons. This action is done in the course of the pontifical vesting rites. 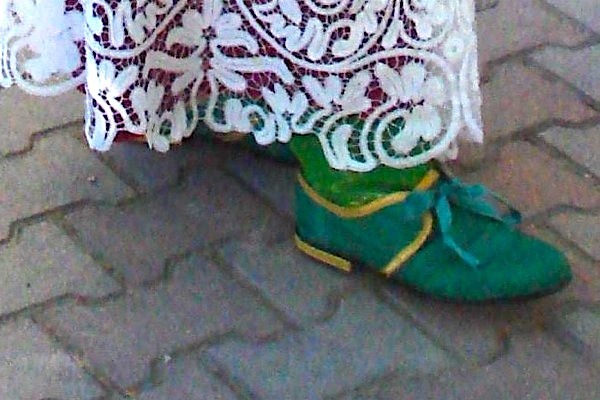 Like pontifical gloves and sandals, buskins come in all of the liturgical colours -- with the exception of black, an exception shared across the three. What you might glean from this description is that buskins, just like sandals, are quite old and have a long pedigree within the liturgical rites of the Church. 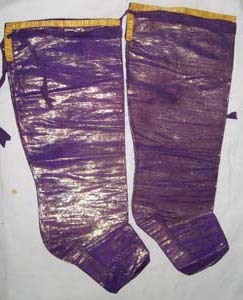 Liturgical stockings, or buskins, are prescribed by the Rubrics and the Ceremonial of Bishops for the celebration of Pontifical Mass. 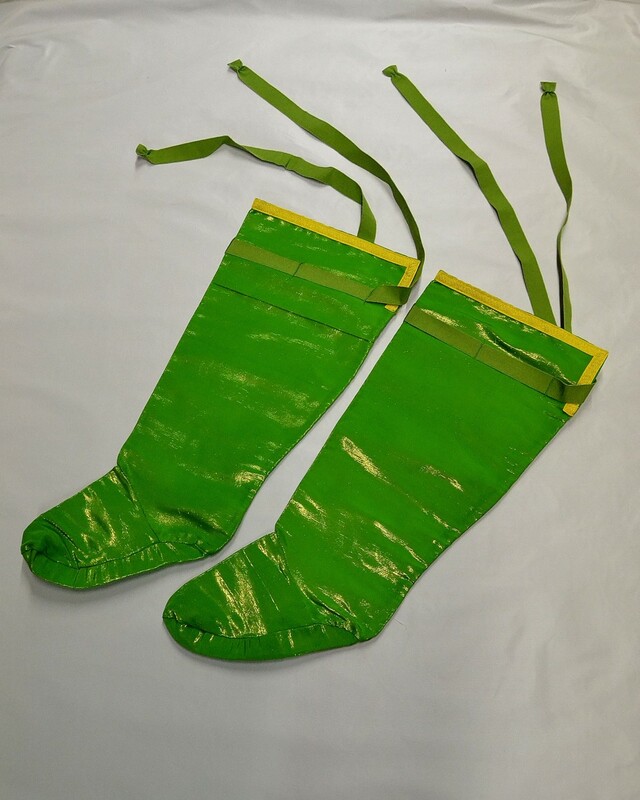 They differ from ordinary stockings [this reference to 'ordinary stockings' comes with reference to what would today be commonly called "socks" -- LAJ], because they have preserved the antique form of stockings previous to the invention of knitting. They are made of silk material, not knitted, but woven and tailored, and their color is the one required by the office of the day, white, red, green, or purple. 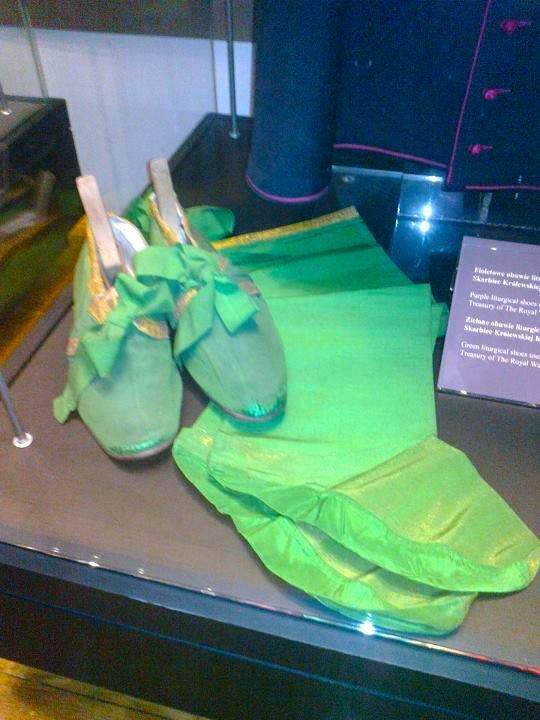 Such stockings are not used at Requiem Mass. 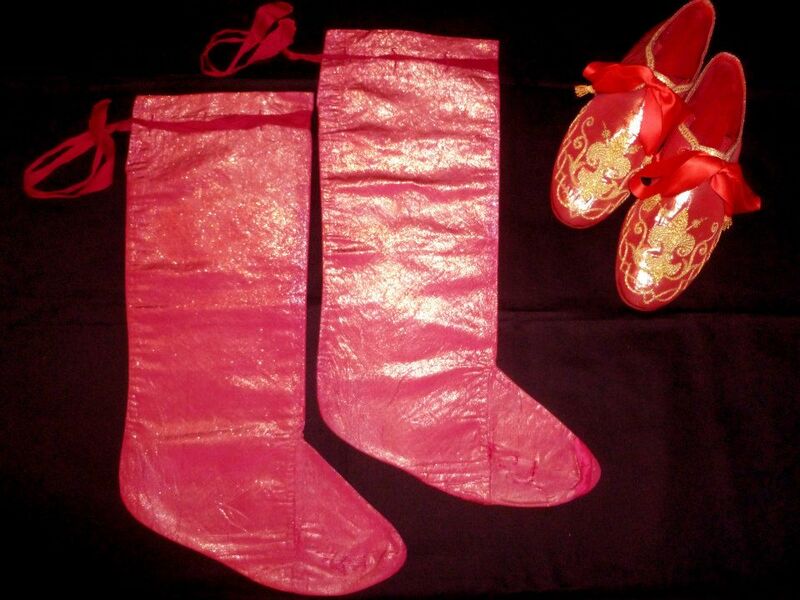 All who, by virtue of their Orders, or by special privilege, are entitled to celebrate Pontifical Mass, wear these stockings. Those of the Pope and Cardinals may be embroidered with gold. Those of Archbishops, Bishops, Protonotaries Apostolic di numero and supernumerary, are made of plain silk and bordered with a gold strip. Those of the Protonotaries ad instar, of Abbots, Canons, etc., may be trimmed with a strip of yellow silk only. The Prelate, while vesting for Pontifical Mass, puts on these buskins over his ordinary stockings or socks, and has them fastened to his leg with a silk ribbon sliding through loops at the top of the buskin; and, when the Prelate wears long trousers, as is the custom in this country [USA], the lower part of the trousers should be folded so as to fit inside the legs of the buskin, thus avoiding the unsightly appear ance of the pontifical sandals partly covered by the black trousers. Cardinals, Prelates invested with the episcopal character, Abbots and the seven Protonotaries Apostolic di numero, put on the liturgical stockings at the throne or at the faldstool, while reciting the prayer " Calcea, Domine, pedes meos... "
Other Protonotaries, Canons and all ecclesiastics who may have received the privilege of celebrating Pontifical Mass, are not permitted to put on their liturgical stockings at the faldstool, but only in the sacristy. With these details in mind, let's take a quick look at some buskins so that we can make clear what we are speaking of. 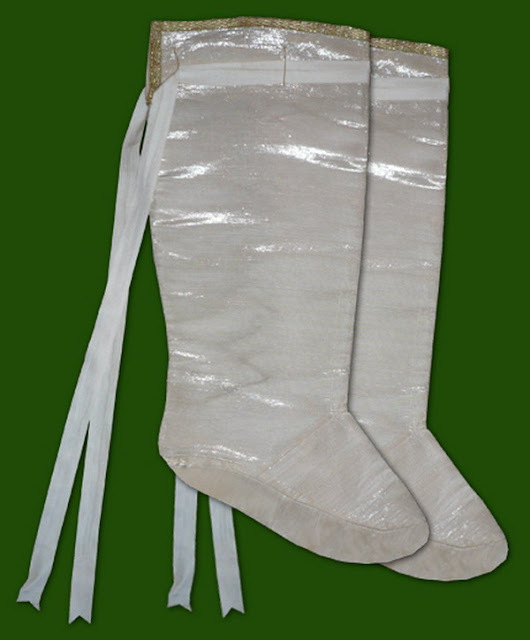 In their basic form, many will recognize them as being similar to that of a "Christmas stocking" -- which is appropriate since stockings are what they indeed are. These particular buskins (see above) are bordered with the yellow strip that Nainfa mentions as being appropriate to lesser prelates such as abbots or certain canons. Below we see those with a gold strip which are permitted to prelates who are 'invested with the episcopal character' -- i.e. bishops. 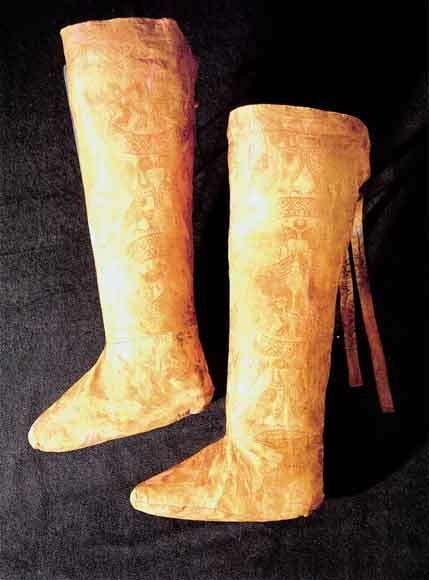 These prescriptions and proscriptions match to those we already described in relation to pontifical sandals, including the fact that more senior prelates, namely cardinals and the pope himself, may also have further embroidered ornamentation on their buskins, just as they may on their sandals. The Buskins Shod my feet, Lord, unto the preparation of the gospel of peace, and protect me under the cover of thy wings. When worn, the final effect is the complete covering of the street clothing of the prelate with a fully liturgical clothing. What ought we make of this then? There can be the temptation on the part of some to dismiss these items as frivolous -- though in doing so they write off a very long standing tradition of the Church in the process and that strikes me as presumptuous (if not arrogant). It should go without saying that these items are not the most important in the greater scheme of things of course, but not being the most important is not the same as being unimportant; this is a critical distinction. The fact of the matter is that for most of the Church's life she has deemed this important enough to do that she did it in the first place and embedded it in her rites -- and that should give the critic pause. It strikes me that elements like buskins (along with corresponding elements like sandals) were adopted early on for clerical use out of an imperative to clothe the cleric in garb befitting the dignity of the liturgical rites and the mysteries contained within them. Whatever the particular originations may have been, as these developed they would vest of the prelate in such a way that it would clothe him liturgically from head to toe -- quite literally. This development is a noble one and far from being some bit of redundant 'pageantry' it represents the liturgical imperative to distinguish the sacred from the secular in our most solemn of liturgical expressions. In this regard then I would urge our prelates, when visiting communities of the the usus antiquior, or when celebrating the solemn pontifical rites in the same, please do not resist these noble liturgical garments; instead, happily take up this longstanding bit of our liturgical patrimony. Even better, taken the initiative to acquire your own sets of pontificals so that you would be at the ready with items that are properly fit to you and thus best suited to the dignity of the sacred liturgy. In closing, I would leave you with a few more images of buskins along with some of their corresponding sandalia.